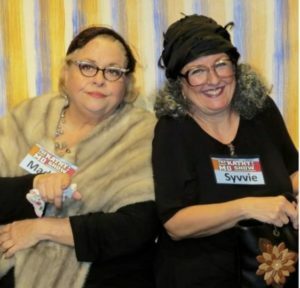 The Kathy & Mo Show: Parallel Lives/The Darker Side at the Smith Theatre has all of the right ingredients to make you laugh the night away. 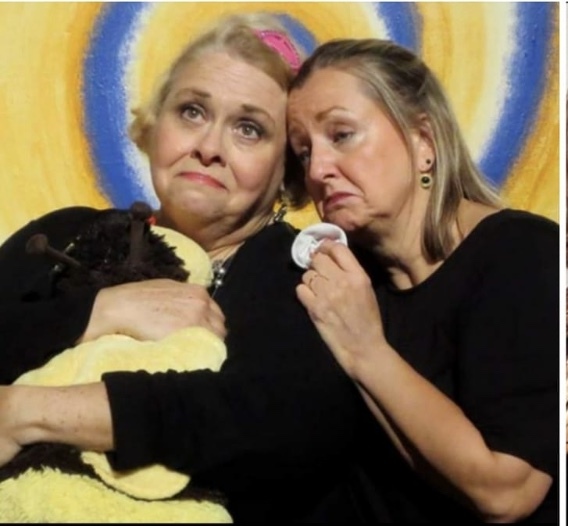 Mary Kate O’Connell and Pamela Rose Mangus star in this sensational show as Kathy & Moe and allow theater-goers to experience why they are known to be the Divas of WNY theater. The show opens with O’Connell and Mangus, two Supreme Beings, who plan the beginning of the world. Once they’ve decided on the color scheme of the races in this world, they are a little concerned that white people will feel slighted being such a boring color. Afraid women will have too many advantages, the Mangus and O’Connell decide to make childbirth painful and to give men enormous egos as compensation. From this moment, the show is filled with comic segments that nicely blend into one another. This Buffalo audience is whisked through the outrageously funny shenanigans of Kathy and Mo, where these multiple Artie award winning actresses play men and women struggling through the common rituals of modern life: teenagers on a date, sisters at their grandmother’s funeral, a cowboy trying to pick up a woman in a country-western bar (my favorite segment of all). Yes, the stage is quite bare but these two actors allow the stage to become alive by the depth of their portrayals. 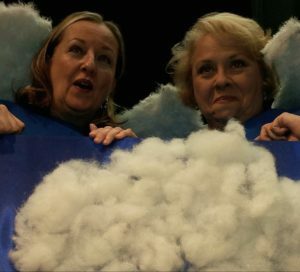 O’Connell and Mangus work great as a team and use every opportunity to send a message to the audience about difficult topics such as death, relationships, diversity and the right to choose. They are at their best when deep in character. This dynamic duo is sure to entertain you and send light-hearted messages that make you think about life all night long. Don’t miss your chance to see this side-splitting O’Connell & Company spectacular! 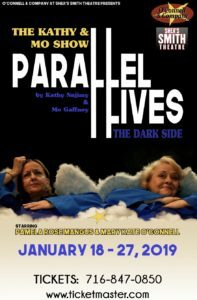 The Kathy & Mo Show: Parallel Lives/The Darker Side plays at the Shea’s Smith Theatre through January 27, 2019. John Pirrone is ecstatic to be joining Totally Buffalo’s team as their Arts and Entertainment contributor. John is no stranger to Western New York’s night life as he is most recognized for playing in one of WNY’s longest running shows–Tony n Tina’s Wedding. For the past 17 Years, John has played the role of the Brides brother, Joey Vitale. With over 400 performances in the same role, Tony n’ Tina’s Wedding remains his favorite role to date. John has appeared in close to 100 shows across Buffalo, Rochester and Long Island. He is also the Producer and Co-owner of Red Carpet Theater Productions. When John is not performing, his day-time position is as a Registered Respiratory Therapist at Respiratory Services of WNY. There, he takes care of critically ill adult and pediatric patients who are in need of life support in the home. Respiratory Services of WNY has been servicing patients for close to 20 years and John is proud to be a part of a team that make a difference in the community. Over the past few years, John has become a Wedding Offciant performing weddings for couples through Western New York. John is ordained in all fifty states and custom creates a unique ceremony that the couple will cherish for a lifetime. As part of John’s Arts and Entertainment segment, he will not only bring you information and reviews on local theater, he will also focus on Western New York’s array of diverse restaurants and eateries. He will encapsulate the dining experience and relay that experience to readers. John Pirrone is ecstatic to be joining Totally Buffalo’s team as their Arts and Entertainment contributor. John is no stranger to Western New York’s night life as he is most recognized for playing in one of WNY’s longest running shows–Tony n Tina’s Wedding. For the past 17 Years, John has played the role of the Brides brother, Joey Vitale. With over 400 performances in the same role, Tony n’ Tina’s Wedding remains his favorite role to date. John has appeared in close to 100 shows across Buffalo, Rochester and Long Island. He is also the Producer and Co-owner of Red Carpet Theater Productions. When John is not performing, his day-time position is as a Registered Respiratory Therapist at Respiratory Services of WNY. There, he takes care of critically ill adult and pediatric patients who are in need of life support in the home. Respiratory Services of WNY has been servicing patients for close to 20 years and John is proud to be a part of a team that make a difference in the community. Over the past few years, John has become a Wedding Offciant performing weddings for couples through Western New York. John is ordained in all fifty states and custom creates a unique ceremony that the couple will cherish for a lifetime. As part of John’s Arts and Entertainment segment, he will not only bring you information and reviews on local theater, he will also focus on Western New York’s array of diverse restaurants and eateries. He will encapsulate the dining experience and relay that experience to readers.